Publisher: Gowarsons Publishers Private Ltd, New Delhi, India. Contributions by Yann Vincent, T.J. Kinne, Srinivas Kulkarni, Vipan Kumar, Bruno and Prabhat Kumar Singh. "goofy" at unilang types the titles. Quote below through Huub. In a 2009 internet newspaper "livemint.com" we read about the Hindi translation. "We wanted to keep the humour of the originals, but ensure that the Indian reader would be able to follow it," says translator Harish M. Sudan. 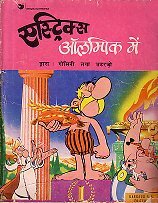 In Asterix aur Kyiopatra, for example, the queen's former food taster celebrates his new found freedom by running away to eat dahi bhalla. The Romans speak with a slight Punjabi twang and greet each other with namastara. Druid Getafix is Vaidyanathix, bard Cacofonix, Besurix, and chief Vitalstatistix, Motumilix. Publisher: Om Books International, Uttar Pradesh, India. This publishing house also published Tintin. More albums will follow.